If you really want something you will do anything in your power to make it happen, or at least try. Which brings me to the key to all of this, time management. Time management is everything to me. It has such a big impact in your life, whether you are a blogger or not. At this moment I work full-time, just last week graduated college (I was studying full-time) and managing my blog part-time. My days are long and it is very easy to want to get home and go straight to bed. However, do not fall into any temptation that will prevent you from achieving your goals. It's so easy to say "Maybe, tomorrow!" or "I'm tired!" I guess that what I am trying to say is that my plate was really full but complaining is the last thing I would ever want to do. Please keep reading to learn about all my tips, trials and errors of trying to juggle this life. Hey, we all have the same 24 hours as Beyoncé, so get to it! Do you really see yourself blogging for the rest of your life? I mean do you really want to share your vision with others and perhaps motivate others? If the answer is yes, and like me you have other responsibilities such as getting to a 9-5 everyday to be able to pay your bills, then you must not give up! I currently wake up by 5:30 a.m. and go to bed around midnight every week night. My work commute is one hour and a half to and from and I usually get home around 6:30 p.m. While on my commute I try to relax and think about my day. As soon as I get to my job it is go time, I work in the legal field so I automatically come in to 20+ emails of things to respond to, work on, schedule, draft and file. So, my mornings essentially require me to relax before entering my work environment. During my lunch break I take the time to review my blogger emails, respond to comments in pictures, post on my instagram story, engage with my followers and sometimes I will edit pictures or choose pictures from a prior shoot. I have one hour to accomplish all these things. I hope i'm not stressing anyone out! Lol. My weekdays are usually occupied with work and until last week, school work. If I ever want to do a flat lay with natural lighting, I really cannot, unless I bring all my props to work and find an open space with a window and shoot! Also, I do not think my boss would be too thrilled at watching me take pictures during my work hours, hehe. Weekends are my days to shoot. Shoot outfits, flat lays, and truly produce my important content. I refuse to rush my content, people can tell when you do not do things with a passion and as a blogger that is the last thing you want to be known as. I am very blessed to have my closest friends be into photography! We love to meet up on weekends and just create, shoot, plan and so forth. From blogging for such a short time, I can tell you that quality photos are a must! Let's face it, would you rather see a nice well composed photo or a low quality image? Sadly, people are attracted to 'nice' photos and so are brands! I personally, look at quality in a photo and the colors play a major role on me liking it. I have yet to pitch to a brand but I know for a fact that if I was a brand and I wanted to collab with a blogger, I would want them to produce quality content for my brand. From blogging for just a little over a year and a half, I have learned that this industry moves at the speed of lightning. One day this trend is up and the next day it is gone. I am not saying to do what everyone else is doing but to look around you and keep expanding and learning about your craft. Do not just stay stagnant and complacent to what you already know. There is always room for improvement. For example, if you were to look at my first ever pictures while blogging and the ones I take now, you will see a significant improvement. A) I have a brand new camera, so we have better quality. B) My poses have changed or at least I am trying to improve them C) My style is slowly evolving, life is too short to only try one style. Here's a tip: Before shooting any look, I plan the style and I save pictures into a little collection on my instagram, of poses I would like to try while wearing my look. It just helps me get a little more organized and in control. I also, do not like wasting my time while shooting. I only get two days to shoot and create content for the week, so for me, there is no room for mediocrity. If a shoot goes bad, I must have a plan b! I recently had a shoot where I didn't have a plan b and that just threw me off my game. Always be prepared, guys! Here's another tip: HAVE FUN! Blogging should never feel like a burden to you. Every chance that I get to document things for my blog I feel blessed and happy to do so. Stay true to your vision and don't get sidetracked in trying to be like everyone else. BE YOU, everyone else is TAKEN! Stay consistent with your passion and everything will eventually fall into place. Also, network. Meet your local bloggers, show GENUINE love to their stuff (if you really like it) and just stay grounded. BE KIND. BE KIND. BE KIND. BE KIND. Everyone is on their own path, everyone is trying to make it somewhere, everyone has battles, and it cost you nothing to be kind and supportive. I decided to try a new look that I had been envisioning in my mind for quite some time. Lingerie with a mix of comfort. I ran across these culottes at Zara for $29.00, they are also my favorite print so I just had to snag these babies! I wanted a lingerie piece but I didn’t want to spend more than $20, since it was a look I was experimenting with. Forever 21 has awesome and affordable lingerie pieces, by the way! Considering that I am not thin, I was nervous to try this look since I am not one to show much skin. Again, that was my doubt speaking! 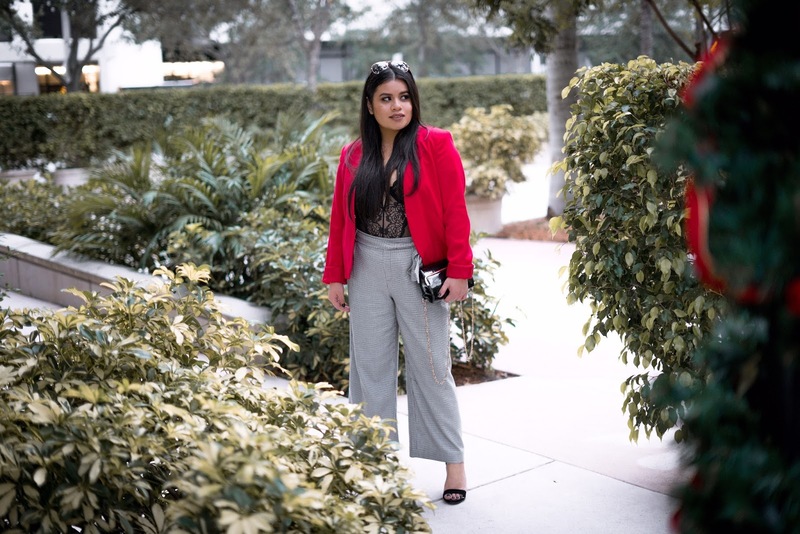 I pulled out an old red blazer from H&M and my go-to $15.00 block heels… and BAM! We had a winner! I would love to do other variations of this look! What do you guys think? Do you like the whole incorporating lingerie to your wardrobe thing? I sure do!